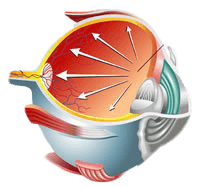 A common laser treatment for glaucoma is called Selective Laser Trabeculoplasty or SLT. This procedure can be used as a first line treatment to reduce eye pressures or as an adjuvant therapy for patients already on glaucoma drops. At Ginsberg Eye, this is a fast, simple in-office procedure done at your convenience. There is no recovery time and great results often happen within a few weeks. The surgical process typically involves numbing the eye with topical eye drops so that you will not feel the laser treatment. In SLT, laser treatment is applied to the drain of your eye in order to open it up and let fluid out, lowering the eye pressure and saving your sight.